Empedocles (c. 490–430 BC) was the first person to propose a theory of light, as far as we know, and he claimed that light has a finite speed. He maintained that light was something in motion, and therefore must take some time to travel. Aristotle argued, to the contrary, that “light is due to the presence of something, but it is not a movement.” Euclid and Ptolemy advanced Empedocles’ emission theory of vision, arguing that light is emitted from the eye, thus enabling sight. Based on that theory, Heron of Alexandria argued that the speed of light must be infinite because distant objects such as stars appear immediately upon opening the eyes. 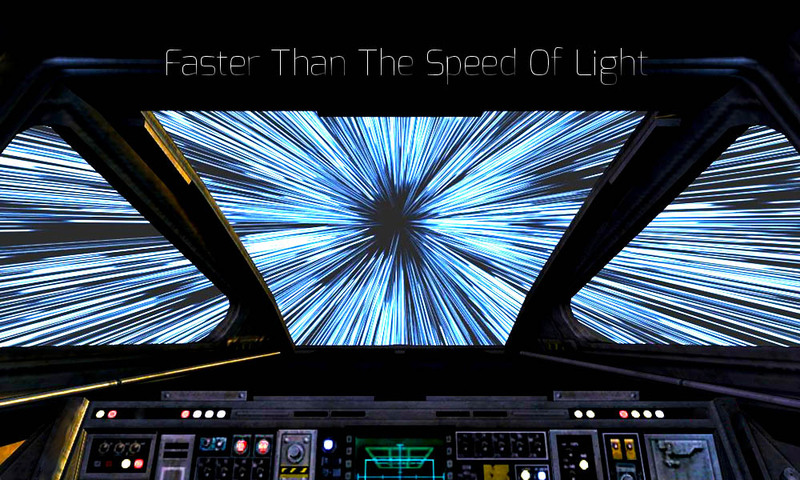 Early Islamic philosophers initially agreed with the Aristotelian view that light had no speed of travel. In 1021, Alhazen (Ibn al-Haytham) published the Book of Optics, in which he presented a series of arguments dismissing the emission theory of vision in favor of the now accepted intromission theory, in which light moves from an object into the eye. This led Alhazen to propose that light must have a finite speed, and that the speed of light is variable, decreasing in denser bodies. He argued that light is substantial matter, the propagation of which requires time, even if this is hidden from our senses. Also in the 11th century, Abū Rayhān al-Bīrūnī agreed that light has a finite speed, and observed that the speed of light is much faster than the speed of sound. In the 13th century, Roger Bacon argued that the speed of light in air was not infinite, using philosophical arguments backed by the writing of Alhazen and Aristotle. In the 1270s, the friar/natural philosopher Witelo considered the possibility of light traveling at infinite speed in vacuum, but slowing down in denser bodies. In the early 17th century, Johannes Kepler believed that the speed of light was infinite, since empty space presents no obstacle to it. René Descartes argued that if the speed of light were to be finite, the Sun, Earth, and Moon would be noticeably out of alignment during a lunar eclipse. Since such misalignment had not been observed, Descartes concluded the speed of light was infinite. Descartes speculated that if the speed of light were found to be finite, his whole system of philosophy might be demolished. In Descartes’ derivation of Snell’s law (concerning the angle that light refracts when passing through media of different densities), he assumed that even though the speed of light was instantaneous, the denser the medium, the faster was light’s speed. Pierre de Fermat derived Snell’s law using the opposing assumption, the denser the medium the slower light traveled. Fermat also argued in support of a finite speed of light – and, of course, if you know your physics, Fermat was right and Descartes was wrong. In 1629, Isaac Beeckman proposed an experiment in which a person observes the flash of a cannon reflecting off a mirror about one mile (1.6 km) away. In 1638, Galileo Galilei proposed an experiment, with an apparent claim to having performed it some years earlier, to measure the speed of light by observing the delay between uncovering a lantern and its perception some distance away. He was unable to distinguish whether light travel was instantaneous or not, but concluded that if it were not, it must nevertheless be extraordinarily rapid. In 1667, the Accademia del Cimento of Florence reported that it had performed Galileo’s experiment, with the lanterns separated by about one mile, but no delay was observed. The actual delay in this experiment would have been about 11 microseconds. 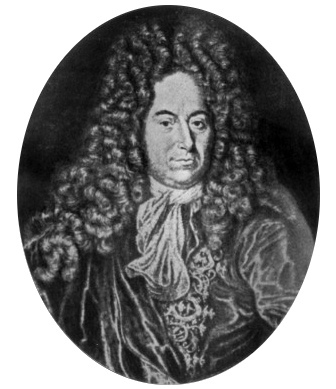 The first quantitative estimate of the speed of light was made in 1676 by Rømer. From the observation that the periods of Jupiter’s innermost moon Io appeared to be shorter when the Earth was approaching Jupiter than when receding from it, he concluded that light travels at a finite speed, and estimated that it takes light 22 minutes to cross the diameter of Earth’s orbit. Christiaan Huygens combined this estimate with an estimate for the diameter of the Earth’s orbit to obtain an estimate of speed of light of 220000 km/s, 26% lower than the actual value. In his 1704 book Opticks, Isaac Newton reported Rømer’s calculations of the finite speed of light and gave a value of “seven or eight minutes” for the time taken for light to travel from the Sun to the Earth (the modern value is 8 minutes 19 seconds). 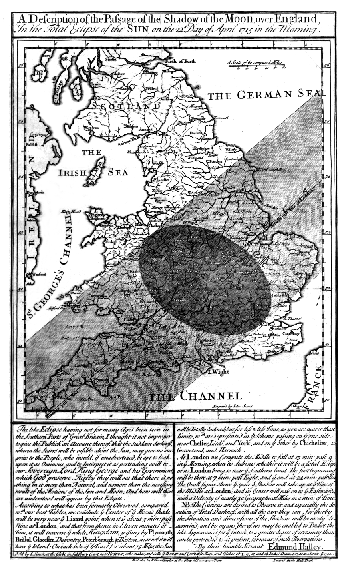 Newton queried whether Rømer’s eclipse shadows were colored; hearing that they were not, he concluded the different colors traveled at the same speed. In 1729, James Bradley discovered stellar aberration. From this effect he determined that light must travel 10,210 times faster than the Earth in its orbit (the modern figure is 10,066 times faster) or, equivalently, that it would take light 8 minutes 12 seconds to travel from the Sun to the Earth. I’ll return to molecular gastronomy one more time for this physics post to be consistent, even though there’s an awful lot of spherical liquid things involved. It does get a tad tiresome after a while. Today is the birthday (1656 [O.S. 29th October]) of Edmond Halley FRS, an English astronomer, geophysicist, mathematician, meteorologist, and physicist, known for the comet named after him, whose periodicity he accurately calculated. Halley was born in Haggerston, in east London. His father came from a Derbyshire family and was a wealthy soap-maker in London. As a child, Halley was very interested in mathematics. He studied at St Paul’s School where he developed his initial interest in astronomy, and from 1673 at The Queen’s College, Oxford. While still an undergraduate, Halley published papers on the Solar System and sunspots. At Oxford, Halley was introduced to John Flamsteed, the Astronomer Royal. Influenced by Flamsteed’s project to compile a catalog of northern stars, Halley proposed to do the same for the Southern Hemisphere. In 1676, Halley visited the south Atlantic island of Saint Helena and set up an observatory with a large sextant with telescopic sights to catalogue the stars of the Southern Hemisphere. While there he observed a transit of Mercury across the Sun, and realized that a similar transit of Venus could be used to determine the absolute size of the Solar System. He returned to England in May 1678. In the following year he went to Danzig (Gdańsk) on behalf of the Royal Society to help resolve a dispute. Because astronomer Johannes Hevelius did not use a telescope, his observations had been questioned by Robert Hooke. Halley stayed with Hevelius and he observed and verified the quality of Hevelius’ observations. In 1679, Halley published the results from his observations on St. Helena as Catalogus Stellarum Australium which included details of 341 southern stars. These additions to contemporary star maps earned him comparison with Tycho Brahe: e.g. 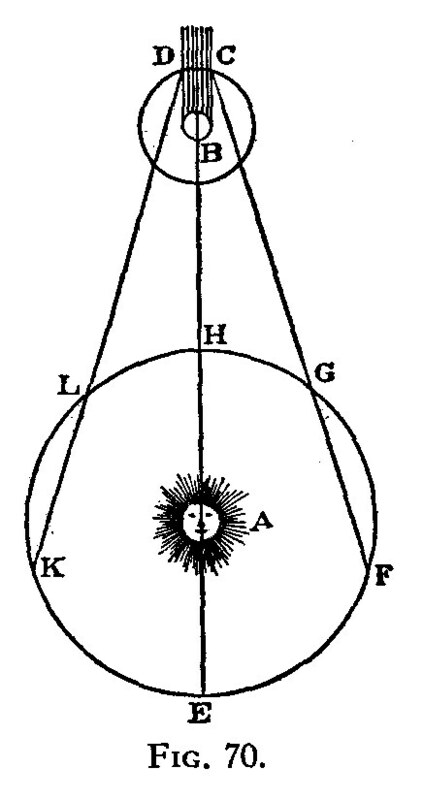 “the southern Tycho” as described by Flamsteed. Halley was awarded his M.A. degree at Oxford and elected as a Fellow of the Royal Society at the age of 22. 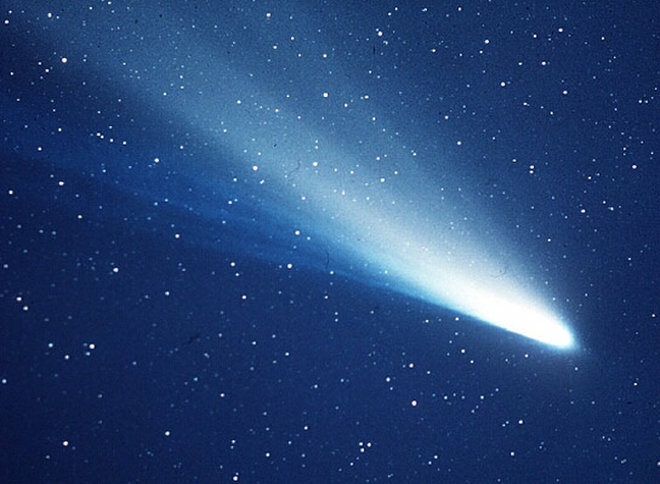 In September 1682 he carried out a series of observations of what became known as Halley’s Comet, though his name became associated with it because of his work on its orbit and predicting its return in 1758 (which he did not live to see). In 1686, Halley published the second part of the results from his Saint Helena expedition, a paper and chart on trade winds and monsoons. The symbols he used to represent trailing winds still exist in most modern-day weather chart representations. In this article he identified solar heating as the cause of atmospheric motions. He also established the relationship between barometric pressure and height above sea level. His charts were an important contribution to the emerging field of information visualization. 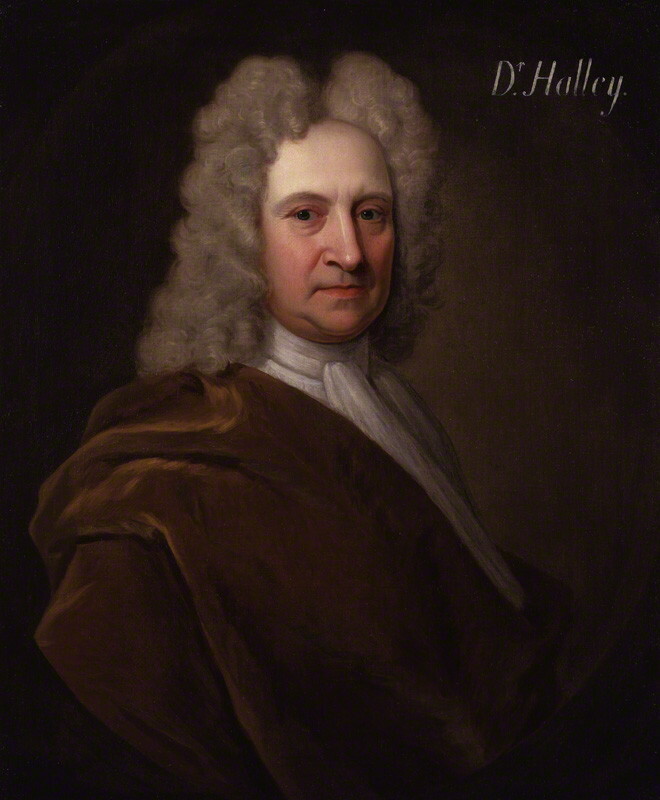 Halley spent most of his time on lunar observations, but was also interested in the problems of gravity. One problem that attracted his attention was the proof of Kepler’s laws of planetary motion. In August 1684, he went to Cambridge to discuss this with Isaac Newton, much as John Flamsteed had done four years earlier, only to find that Newton had solved the problem, at the instigation of Flamsteed with regard to the orbit of comet Kirch, without publishing the solution. Halley asked to see the calculations and was told by Newton that he could not find them, but promised to redo them and send them on later, which he eventually did, in a short treatise entitled, “On the motion of bodies in an orbit.” Halley recognized the importance of the work and returned to Cambridge to arrange its publication with Newton, who instead went on to expand it into his Philosophiæ Naturalis Principia Mathematica published at Halley’s expense in 1687. Halley’s first calculations with comets were thereby for the orbit of comet Kirch, based on Flamsteed’s observations in 1680-1. Although he was to accurately calculate the orbit of the comet of 1682, he was inaccurate in his calculations of the orbit of comet Kirch. They indicated a periodicity of 575 years, thus appearing in the years 531 and 1106, and presumably heralding the death of Julius Caesar in a like fashion in (45 BCE). It is now known to have an orbital period of circa 10,000 years. In 1691, Halley built a diving bell, a device in which the atmosphere was replenished by way of weighted barrels of air sent down from the surface. In a demonstration, Halley and five companions dived to 60 feet (18 m) in the River Thames, and remained there for over an hour and a half. Halley’s bell was of little use for practical salvage work, as it was very heavy, but he made improvements to it over time, later extending his underwater exposure time to over 4 hours. Halley suffered one of the earliest recorded cases of middle ear barotrauma. That same year, at a meeting of the Royal Society, Halley introduced a rudimentary working model of a magnetic compass using a liquid-filled housing to damp the swing and wobble of the magnetized needle. In 1691, Halley sought the post of Savilian Professor of Astronomy at Oxford. While a candidate for the position, Halley faced the animosity of the Astronomer Royal, John Flamsteed, and his religious views were questioned. His candidacy was opposed by both the Archbishop of Canterbury, John Tillotson, and Bishop Stillingfleet, and the post went instead to David Gregory, who had the support of Isaac Newton. In 1693 Halley published an article on life annuities, which featured an analysis of age-at-death on the basis of the Breslau statistics Caspar Neumann had been able to provide. This article allowed the British government to sell life annuities at an appropriate price based on the age of the purchaser. Halley’s work strongly influenced the development of actuarial science. The construction of the life-table for Breslau, which followed more primitive work by John Graunt, is now seen as a major event in the history of demography. In 1698, Halley was given command of the Paramour, a 52 feet (16 m) pink (sailing ship), so that he could carry out investigations in the South Atlantic into the laws governing the variation of the compass. On 19th August 1698, he took command of the ship and, in November 1698, sailed on what was the first purely scientific voyage by an English naval vessel. Unfortunately, problems of insubordination arose over questions of Halley’s competence to command a vessel. Halley returned the ship to England to bring charges against his officers in July 1699. The result was a mild rebuke for his men, and dissatisfaction for Halley, who felt the court had been too lenient. Halley thereafter received a temporary commission as a Captain in the Royal Navy, recommissioned the Paramour on 24th August 1699 and sailed again in September 1699 to make extensive observations on the conditions of terrestrial magnetism. He accomplished this task in a second Atlantic voyage which lasted until 6th September 1700, and extended from 52 degrees north to 52 degrees south. The results were published in General Chart of the Variation of the Compass (1701). This was the first such chart to be published and the first on which isogonic, or Halleyan, lines appeared. In November 1703, Halley was appointed Savilian Professor of Geometry at the University of Oxford, his theological enemies, John Tillotson and Bishop Stillingfleet having died, and received an honorary degree of doctor of laws in 1710. In 1705, applying historical astronomy methods, he published Synopsis Astronomia Cometicae, which stated his belief that the comet sightings of 1456, 1531, 1607, and 1682 were of the same comet, which he predicted would return in 1758. Halley did not live to witness the comet’s return, but when it did, the comet became generally known as Halley’s Comet. By 1706 Halley had learned Arabic and completed the translation started by Edward Bernard of Books V-VII of Apollonius’s Conics from copies found at Leiden and the Bodleian Library at Oxford. He also completed a new translation of the first four books from the original Greek that had been started by the late David Gregory. He published these along with his own reconstruction of Book VIII in the first complete Latin edition in 1710. In 1716, Halley suggested a high-precision measurement of the distance between the Earth and the Sun by timing the transit of Venus. 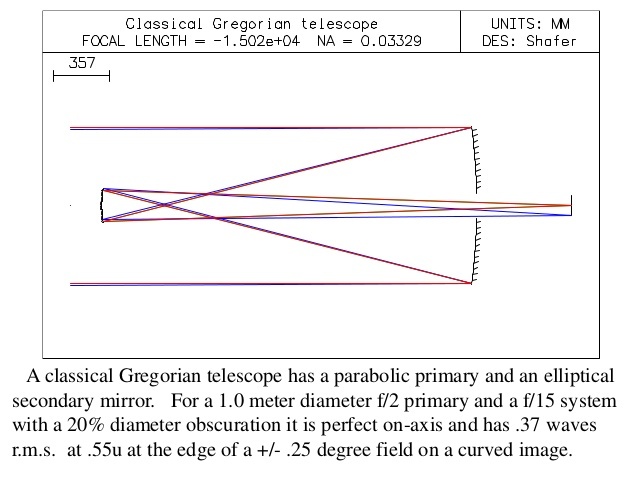 In doing so, he was following the method described by James Gregory in Optica Promota (in which the design of the Gregorian telescope is also described). It is reasonable to assume Halley possessed and had read this book given that the Gregorian design (a reflecting telescope) was the principal telescope design used in astronomy in Halley’s day. It is not to Halley’s credit that he failed to acknowledge Gregory’s priority in this matter. In 1718 he discovered the proper motion of the “fixed” stars by comparing his astrometric measurements with those given in Ptolemy’s Almagest. Arcturus and Sirius were two noted to have moved significantly, the latter having progressed 30 arc minutes (about the diameter of the moon) southwards in 1800 years. In 1720, together with his friend the antiquarian William Stukeley, Halley participated in the first attempt to scientifically date Stonehenge. Assuming that the monument had been laid out using a magnetic compass, Stukeley and Halley attempted to calculate the perceived deviation introducing corrections from existing magnetic records, and suggested three dates (460 BCE, 220 CE and 920 CE), the earliest being the one accepted. These dates were wrong by thousands of years, but the idea that scientific methods could be used to date ancient monuments was revolutionary in its day. Halley succeeded John Flamsteed in 1720 as Astronomer Royal, a position Halley held until his death. 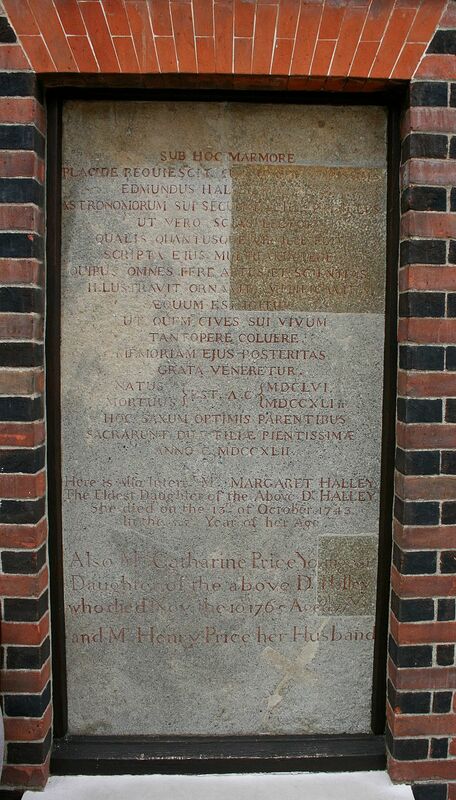 Halley died in 1742 at the age of 85. He was buried in the graveyard of the old church of St Margaret’s, Lee (since rebuilt), at Lee Terrace, Blackheath. He was interred in the same vault as the Astronomer Royal John Pond; the unmarked grave of the Astronomer Royal Nathaniel Bliss is nearby. 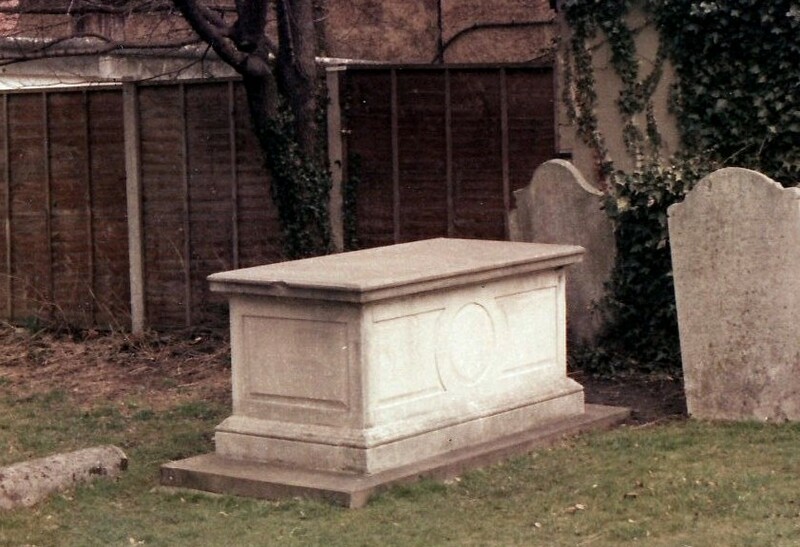 His original tombstone was transferred by the Admiralty when the original Lee church was demolished and rebuilt – it can be seen today on the southern wall of the Camera Obscura at the Royal Observatory, Greenwich. His marked grave can be seen at St Margaret’s Church, Lee Terrace. For no other reason than the name, I give you a recipe for hasty pudding from a manuscript dated 1742. 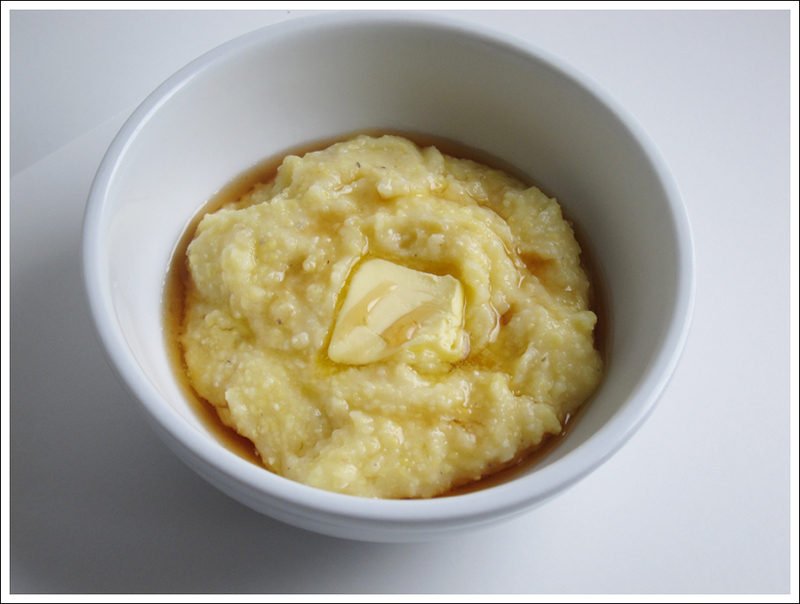 Hasty pudding was popular in the 18th century because, as the name implies, it was a quick and easy dessert. In this case, I suspect that the second sentence means to add the flour and butter mix to boiling milk and continue cooking. Otherwise the flour would not cook, and that would be rather nasty. Actually, the whole affair seems pretty nasty to me, but I like the idea of celebrating a man who tracked comets – which return slooooooooooowly – with a recipe for something hasty. Break an egg into fine flour, and with your hand work up as much as you can into as stiff a paste as possible. Add milk boiling, and put in a little salt, some rose water, or orange-flower water, a few drops put to your taste, some butter, and keep stirring all one way till it is thick as you would have it, pour it oute and when it is in the dishe stick it all over with littel bits of butter, and beaten cinnamon over. Young was born in Milverton in Somerset, the eldest of 10 children in a Quaker family. By the age of 14 Young had learned Greek and Latin and was acquainted with French, Italian, Hebrew, German, Aramaic, Syriac, Samaritan, Arabic, Persian, Turkish and Amharic. He began to study medicine in London at St Bartholomew’s Hospital in 1792, moved to the University of Edinburgh Medical School in 1794, and a year later went to the University of Göttingen in Lower Saxony where he obtained the degree of doctor of medicine in 1796. In 1797 he entered Emmanuel College, Cambridge. 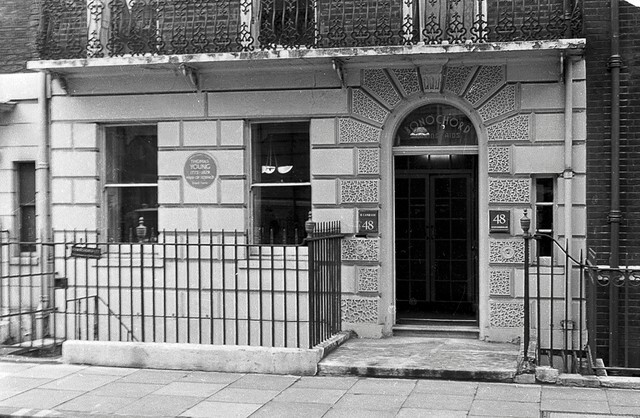 In the same year he inherited the estate of his grand-uncle, Richard Brocklesby, which made him financially independent, and in 1799 he established himself as a physician at 48 Welbeck Street, London (now recorded with a blue plaque). Young published many of his first academic articles anonymously to protect his reputation as a physician. 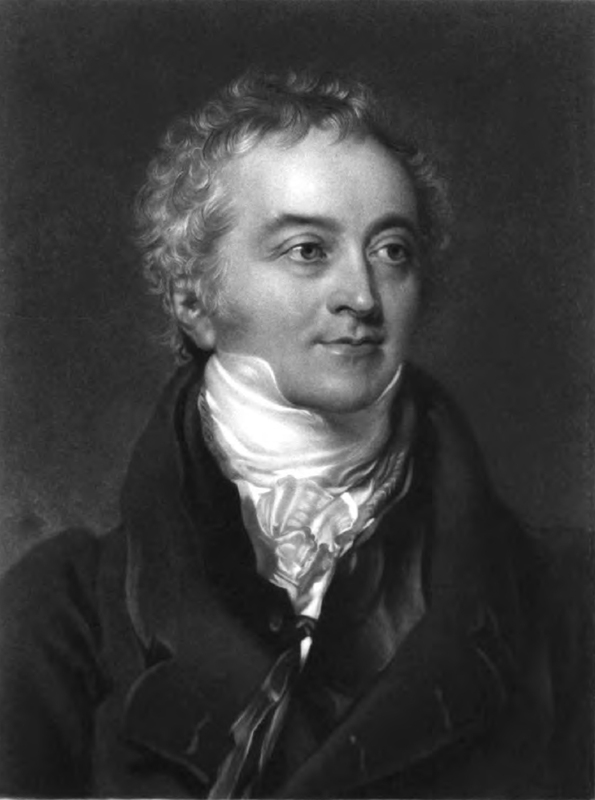 In 1801, Young was appointed professor of natural philosophy (mainly physics) at the Royal Institution. In two years, he delivered 91 lectures. 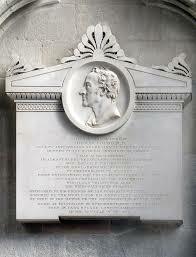 In 1802, he was appointed foreign secretary of the Royal Society, of which he had been elected a fellow in 1794. He resigned his professorship in 1803, fearing that its duties would interfere with his medical practice. His lectures were published in 1807 in the Course of Lectures on Natural Philosophy and contain a number of anticipations of later theories. In 1811, Young became physician to St George’s Hospital, and in 1814 he served on a committee appointed to consider the dangers involved in the general introduction of gas for lighting into London. In 1816 he was secretary of a commission charged with ascertaining the precise length of the seconds pendulum (the length of a pendulum whose period is exactly 2 seconds), and in 1818 he became secretary to the Board of Longitude and superintendent of the HM Nautical Almanac Office. Sacred to the memory of Thomas Young, M.D., Fellow and Foreign Secretary of the Royal Society Member of the National Institute of France; a man alike eminent in almost every department of human learning. Patient of unintermitted labour, endowed with the faculty of intuitive perception, who, bringing an equal mastery to the most abstruse investigations of letters and of science, first established the undulatory theory of light, and first penetrated the obscurity which had veiled for ages the hieroglyphs of Egypt. Endeared to his friends by his domestic virtues, honoured by the World for his unrivalled acquirements, he died in the hopes of the Resurrection of the just. — Born at Milverton, in Somersetshire, 13 June 1773. Died in Park Square, London, 10 May 1829, in the 56th year of his age. Young was highly regarded by his friends and colleagues. He was said never to impose his knowledge, but if asked was able to answer even the most difficult scientific question with ease. Although very learned he had a reputation for sometimes having difficulty in communicating his knowledge. It was said by one of his contemporaries that, “His words were not those in familiar use, and the arrangement of his ideas seldom the same as those he conversed with. He was therefore worse calculated than any man I ever knew for the communication of knowledge.” Young is quite well known by scholars in different fields but they usually know him only for his work in their specialties, not as a polymath. I’ll just list briefly the areas where he made significant contributions – with a small synopsis. In Young’s own judgment, of his many achievements the most important was to establish the wave theory of light. To do so, he had to overcome the view, expressed in the highly esteemed Isaac Newton’s Opticks, that light is a particle. Nevertheless, in the early-19th century Young put forth a number of theoretical reasons supporting the wave theory of light, and he developed two enduring demonstrations to support this viewpoint. With the ripple tank he demonstrated the idea of interference in the context of water waves. With his interference experiment (the now-classic double-slit experiment), he demonstrated interference in the context of light as a wave. After publishing a paper on interference, he published a paper entitled “Experiments and Calculations Relative to Physical Optics” in 1804. 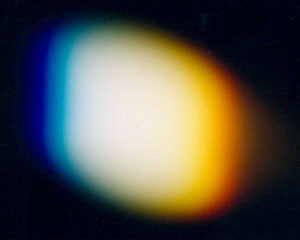 Young describes an experiment in which he placed a narrow card (approximately 1/30th inch) in a beam of light from a single opening in a window and observed the fringes of color in the shadow and to the sides of the card. He observed that placing another card before or after the narrow strip so as to prevent light from the beam from striking one of its edges caused the fringes to disappear. This supported the contention that light is composed of waves. Young performed and analyzed a number of experiments, including interference of light from reflection off nearby pairs of micrometer grooves, from reflection off thin films of soap and oil, and from Newton’s rings. He also performed two important diffraction experiments using fibers and long narrow strips. In his Course of Lectures on Natural Philosophy and the Mechanical Arts (1807) he gives Grimaldi credit for first observing the fringes in the shadow of an object placed in a beam of light. Within ten years, much of Young’s work was reproduced and then extended by others. Engineers all know Young’s modulus, which describes the elasticity of materials beyond the limits of Hook’s Law. Hook’s Law describes the direct, proportional correlation between the load on a spring, and the extension of the spring “provided the load is not too great.” The proviso is there because if the load is “too great” all bets are off. Young’s modulus takes care of that. Young described his findings in his Course of Lectures on Natural Philosophy and the Mechanical Arts. However, the first use of the concept of Young’s modulus in experiments was by Giordano Riccati in 1782, predating Young by 25 years. Furthermore, the idea can be traced to a paper by Leonhard Euler published in 1727, 80 years before Young’s 1807 paper on the subject. Nonetheless, Young’s application was the one generally adopted by engineers. Young’s Modulus allowed, for the first time, prediction of the strain in a component subject to a known stress (and vice versa). Prior to Young’s contribution, engineers were required to apply Hooke’s F = kx relationship to identify the deformation (x) of a body subject to a known load (F), where the constant (k) is a function of both the geometry and material under consideration. Finding k required physical testing for any new component, as the F = kx relationship is a function of both geometry and material. 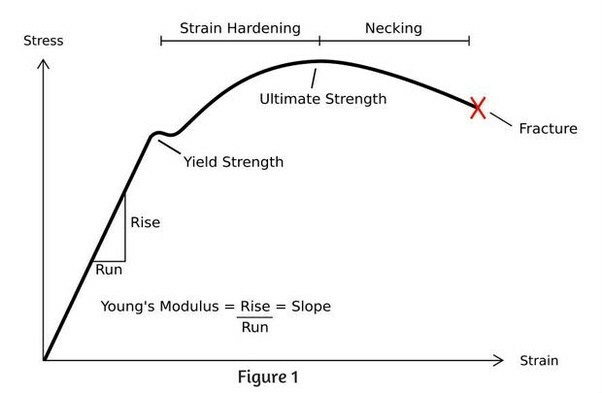 Young’s Modulus depends only on the material, not its geometry, thus allowing a revolution in engineering strategies. Young has sometimes been called the founder of physiological optics. In 1793 he explained the mode in which the eye accommodates itself to vision at different distances as depending on change of the curvature of the crystalline lens; in 1801 he was the first to describe astigmatism; and in his lectures he presented the hypothesis, afterwards developed by Hermann von Helmholtz, (the Young–Helmholtz theory), that color perception depends on the presence in the retina of three kinds of nerve fibers. This foreshadowed the modern understanding of color vision, in particular the finding that the eye does indeed have three colour receptors which are sensitive to different wavelength ranges. In 1804, Young developed the theory of capillary action based on the principle of surface tension. He also observed the constancy of the angle of contact of a liquid surface with a solid, and showed how to deduce the phenomenon of capillary action from these two principles. In 1805, Pierre-Simon Laplace, the French philosopher, discovered the significance of meniscus radii with respect to capillary action. In 1830, Carl Friedrich Gauss, the German mathematician, unified the work of these two scientists to derive the Young–Laplace equation, the formula that describes the capillary pressure difference sustained across the interface between two static fluids. Young’s equation describes the contact angle of a liquid drop on a plane solid surface as a function of the surface free energy, the interfacial free energy and the surface tension of the liquid. Young’s equation was developed further some 60 years later by Dupré to account for thermodynamic effects, and this is known as the Young–Dupré equation. In physiology Young made an important contribution to haemodynamics in the Croonian lecture for 1808 on the “Functions of the Heart and Arteries,” where he derived a formula for the wave speed of the pulse and his medical writings included An Introduction to Medical Literature, including a System of Practical Nosology (1813) and A Practical and Historical Treatise on Consumptive Diseases (1815). Young devised a rule of thumb for determining a child’s drug dosage. Young’s Rule states that the child dosage is equal to the adult dosage multiplied by the child’s age in years, divided by the sum of 12 plus the child’s age. In an appendix to his Göttingen dissertation (1796; “De corporis hvmani viribvs conservatricibvs. Dissertatio.”) there are four pages added proposing a universal phonetic alphabet (so as ‘not to leave these pages blank’ – Ne vacuae starent hae paginae, libuit e praelectione ante disputationem habenda tabellam literarum vniuersalem raptim describere”). It includes 16 “pure” vowel symbols, nasal vowels, various consonants, and examples of these, drawn primarily from French and English. In his Encyclopædia Britannica article “Languages”, Young compared the grammar and vocabulary of 400 languages. In a separate work in 1813, he introduced the term “Indo-European” languages, 165 years after the Dutch linguist Marcus Zuerius van Boxhorn proposed the grouping to which this term refers in 1647. Young made significant contributions in the decipherment of Egyptian hieroglyphs. He started his Egyptology work rather late, in 1813, when the work was already in progress among other researchers. He began by using an Egyptian demotic alphabet of 29 letters built up by Johan David Åkerblad in 1802 (14 turned out to be incorrect). Åkerblad was correct in stressing the importance of the demotic text in trying to read the inscriptions, but he wrongly believed that demotic was entirely alphabetic. By 1814 Young had completely translated the “enchorial” text of the Rosetta Stone (using a list with 86 demotic words), and then studied the hieroglyphic alphabet but initially failed to recognize that the demotic and hieroglyphic texts were paraphrases and not simple translations. There was considerable rivalry between Young and Jean-François Champollion while both were working on hieroglyphic decipherment. At first they briefly cooperated in their work, but later, from around 1815, a chill arose between them. For many years they kept details of their work away from each other. Some of Young’s conclusions appeared in the famous article “Egypt” he wrote for the 1818 edition of the Encyclopædia Britannica. When Champollion finally published a translation of the hieroglyphs and the key to the grammatical system in 1822, Young (and many others) praised his work. 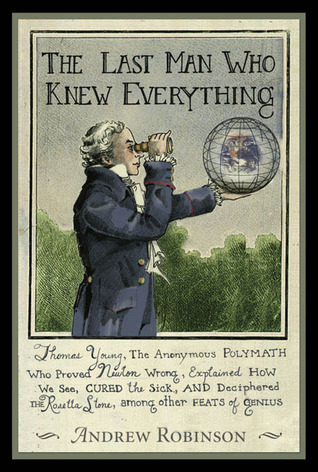 Nevertheless, a year later Young published an Account of the Recent Discoveries in Hieroglyphic Literature and Egyptian Antiquities, to have his own work recognized as the basis for Champollion’s system. 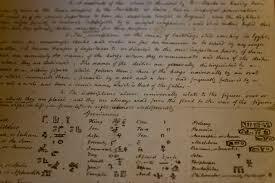 Young had correctly found the sound value of six hieroglyphic signs, but had not deduced the grammar of the language. Young, himself, acknowledged that he was somewhat at a disadvantage because Champollion’s knowledge of the relevant languages, such as Coptic, was much greater. Several scholars have suggested that Young’s true contribution to Egyptology was his decipherment of the demotic script. He made the first major advances in this area. He also correctly identified demotic as being composed of both ideographic and phonetic signs. Young developed two systems of tuning a piano so that it was well tempered (Wohltemperiert), that is, was tuned so as to be able to modulate between all major and minor scales without sounding obviously out of tune in any of them. Discussions of temperaments get really technical really quickly. Young’s first temperament was designed to sound best in the keys that were the commonest, and his second was a kind of inversion of the first. Unless you know the difference between BƄ and A#, and the differences that their major and minor thirds make in chords, this will not make any sense to you. It is a problem in the physics of acoustics, essentially. Historians and critics vary enormously in their assessment of Young. Without question he was well versed in all the fields above – and more – and was able to expound on them critically (if not always clearly). How original his contributions were to the various fields, is the subject of ongoing debate. The idea than he was the last man to know everything, is obvious (and intentional) hyperbole. But it also highlights the fact that at the beginning of the 19th century it was still possible to gain expert knowledge in widely diverse fields. Furthermore, Young not only knew a lot of stuff, he was able to make contributions to diverse fields. Whether or not he was always entirely original is beside the point as far as I am concerned. We’re talking about a man who made contributions – recognized as significant by experts – in half a dozen specialties, that most of us do not even understand, let alone are capable of mastering. As I have done quite a number of times with birthdays recently, I’ll celebrate Young with a recipe from his home region, Somerset. 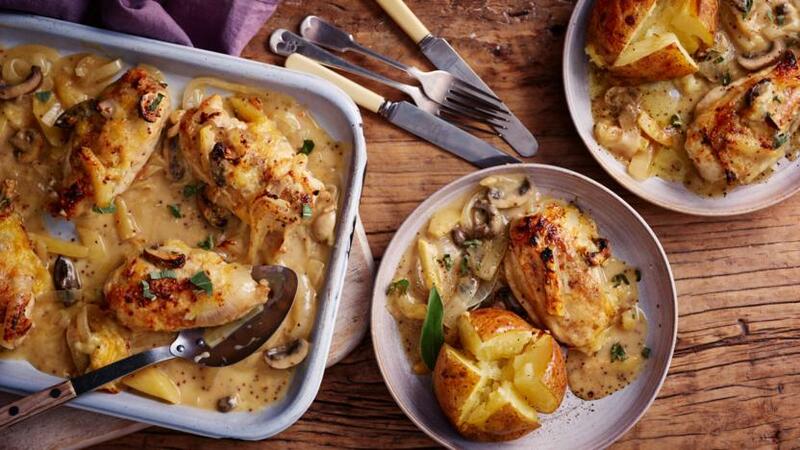 Somerset is well known for apples, cider, and dairying, and this recipe for Somerset chicken, which is traditional, combines all three. Preheat the oven to 200˚C/400˚F. Season the chicken breasts with salt and freshly ground black pepper. Heat a large skillet until smoking, then add half of the butter and oil. Fry the chicken breasts in batches, skin-side down first, for 5 minutes on each side, making sure they are golden-brown all over. Transfer the chicken breasts to a baking dish and keep warm. Return the skillet to the heat and add the remaining butter and oil. Add the onions and cook for 4-5 minutes, or until softened but without taking on color. Stir in the flour and the mustard and cook for a further 1-2 minutes. Add the apples and mushrooms and cook for a further minute, then pour the chicken stock over ingredients. Bring the skillet to the boil, add the cider and return to the boil. Cook for 1-2 minutes, then lower the heat, add the sage and stir in the cream. Simmer for a further 5-6 minutes, then season with salt and freshly ground black pepper to taste. Pour the sauce over the chicken in the baking pan. Sprinkle the cheddar cheese over the chicken and place under the broiler for 4-5 minutes, or until the cheese is melted, golden-brown and bubbling. Serve with baked or boiled new potatoes. 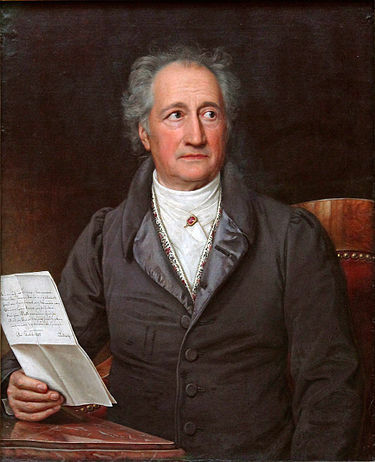 Today is the birthday (1749) of Johann Wolfgang von Goethe, German writer, scientist, and statesman. His body of work includes epic and lyric poetry; prose and verse dramas; memoirs; an autobiography; literary and aesthetic criticism; treatises on botany, anatomy, and color; and four novels. In addition, numerous literary and scientific fragments, more than 10,000 letters, and nearly 3,000 drawings by him are extant. A literary celebrity by the age of 25, Goethe was ennobled by the Duke of Saxe-Weimar, Karl August, in 1782 after first taking up residence there in November 1775 following the success of his first novel, The Sorrows of Young Werther. He was an early participant in the Sturm und Drang literary movement. 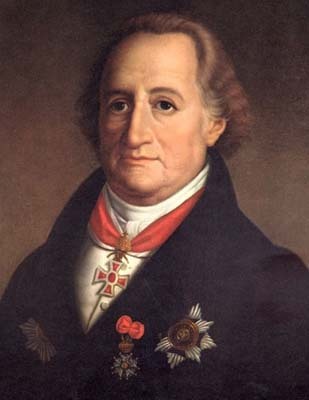 During his first ten years in Weimar, Goethe served as a member of the Duke’s privy council, sat on the war and highway commissions, oversaw the reopening of silver mines in nearby Ilmenau, and implemented a series of administrative reforms at the University of Jena. He also contributed to the planning of Weimar’s botanical park and the rebuilding of its Ducal Palace, which in 1998 were together designated a UNESCO World Heritage Site. After returning from a tour of Italy in 1788, his first major scientific work, the Metamorphosis of Plants, was published. In 1791 he was made managing director of the theatre at Weimar, and in 1794 he began a friendship with the dramatist, historian, and philosopher Friedrich Schiller, whose plays he premiered until Schiller’s death in 1805. During this period Goethe published his second novel, Wilhelm Meister’s Apprenticeship, the verse epic Hermann and Dorothea, and, in 1808, the first part of his most celebrated drama, Faust. His conversations and various common undertakings throughout the 1790s with Schiller, Johann Gottlieb Fichte, Johann Gottfried Herder, Alexander von Humboldt, Wilhelm von Humboldt, and August and Friedrich Schlegel have, in later years, been collectively termed Weimar Classicism. I’m going to work on my usual principle of assuming you either know Goethe or you don’t, so dribbling on about his writings is going to bore you or annoy you (possibly both). Instead I will do two things. First, I present a few of potentially thousands of poignant quotes. Second, I give you a brief outline of his theory of color which has had a major impact on philosophers, psychologists, and artists even though it radically conflicts with Newton and physical science. One must be something in order to do something. I have found a paper of mine among some others in which I call architecture ‘petrified music.’ Really there is something in this; the tone of mind produced by architecture approaches the effect of music. The artist may be well advised to keep his work to himself till it is completed, because no one can readily help him or advise him with it…but the scientist is wiser not to withhold a single finding or a single conjecture from publicity. The world is so empty if one thinks only of mountains, rivers and cities; but to know someone here and there who thinks and feels with us, and though distant, is close to us in spirit — this makes the earth for us an inhabited garden. Yet gladly he drinks their wines. In The Theory of Colors (original German title Zur Farbenlehre) Goethe lays out his views on the nature of colors and how they are perceived by humans. 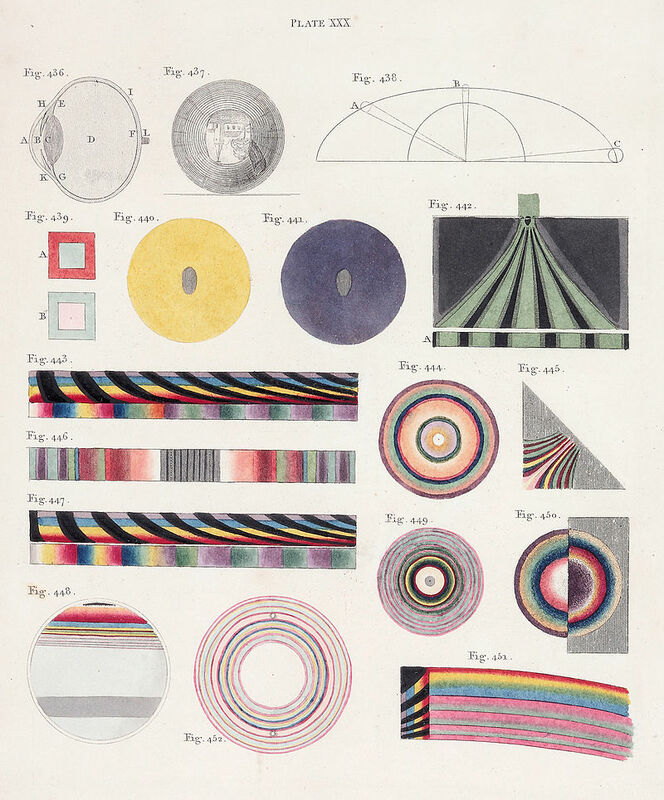 Published in 1810, it contains detailed descriptions of phenomena such as colored shadows, refraction, and chromatic aberration. The work originated in Goethe’s occupation with painting and had a major influence on painters (e.g. Philipp Otto Runge, J. M. W. Turner, the Pre-Raphaelites, Wassily Kandinsky). Although rejected by mainstream physics it influenced philosophers and certain physicists including Thomas Johann Seebeck, Arthur Schopenhauer (On Vision and Colors), Hermann von Helmholtz, Rudolf Steiner, Ludwig Wittgenstein, Werner Heisenberg, Kurt Gödel, and Mitchell Feigenbaum. Goethe’s book provides a catalogue of how color is perceived in a wide variety of circumstances, and considers Isaac Newton’s observations to be special cases. Unlike Newton, Goethe’s concern was not so much with the analytic treatment of color, as with the qualities of how phenomena are perceived. Philosophers have come to understand the distinction between the optical spectrum, as observed by Newton, and the phenomenon of human color perception as presented by Goethe—a subject analyzed at length by Wittgenstein in his exegesis of Goethe in Remarks on Colour. 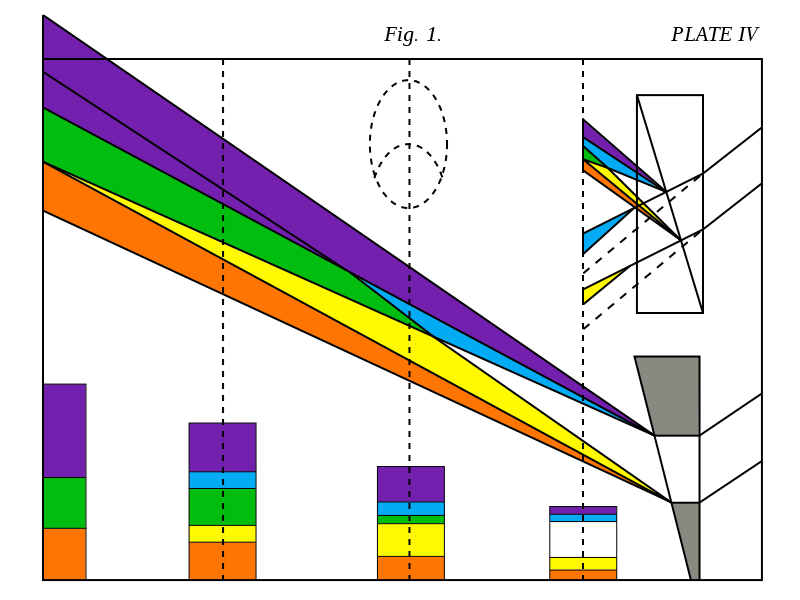 In Goethe’s time, it was generally acknowledged that, as Isaac Newton had shown in his Opticks in 1704, colorless (white) light is split up into its component colors when directed through a prism. 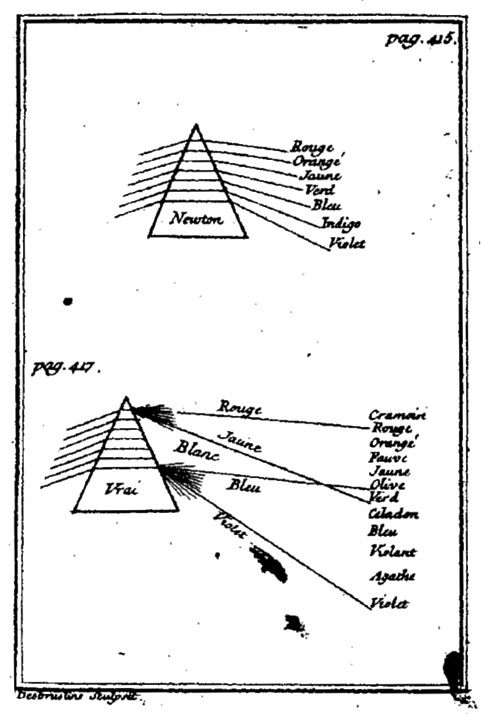 As Goethe notes Louis Bertrand Castel had already published a criticism of Newton’s spectral description of prismatic color in 1740 in which he observed that the sequence of colors split by a prism depended on the distance from the prism — and that Newton was looking at a special case. 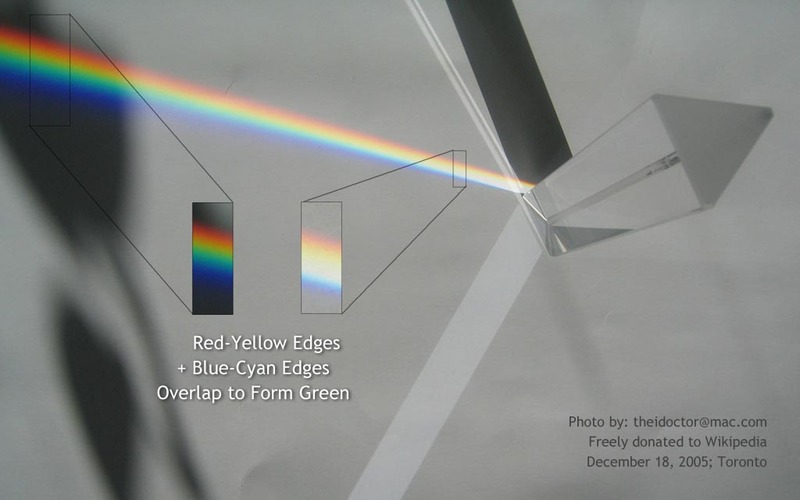 Whereas Newton observed the colour spectrum cast on a wall at a fixed distance away from the prism, Goethe observed the cast spectrum on a white card which was progressively moved away from the prism… As the card was moved away, the projected image elongated, gradually assuming an elliptical shape, and the coloured images became larger, finally merging at the centre to produce green. Moving the card farther led to the increase in the size of the image, until finally the spectrum described by Newton in the Opticks was produced… The image cast by the refracted beam was not fixed, but rather developed with increasing distance from the prism. Consequently, Goethe saw the particular distance chosen by Newton to prove the second proposition of the Opticks as capriciously imposed. Modern natural science sees darkness as a complete nothingness. According to this view, the light which streams into a dark space has no resistance from the darkness to overcome. Goethe pictures to himself that light and darkness relate to each other like the north and south pole of a magnet. The darkness can weaken the light in its working power. Conversely, the light can limit the energy of the darkness. In both cases color arises. Yellow is a light which has been dampened by darkness; Blue is a darkness weakened by light. Goethe’s studies of color began with experiments which examined the effects of turbid media, such as air, dust, and moisture on the perception of light and dark. The poet observed that light seen through a turbid medium appears yellow, and darkness seen through an illuminated medium appears blue. The highest degree of light, such as that of the sun… is for the most part colourless. This light, however, seen through a medium but very slightly thickened, appears to us yellow. If the density of such a medium be increased, or if its volume become greater, we shall see the light gradually assume a yellow-red hue, which at last deepens to a ruby colour. If on the other hand darkness is seen through a semi-transparent medium, which is itself illumined by a light striking on it, a blue colour appears: this becomes lighter and paler as the density of the medium is increased, but on the contrary appears darker and deeper the more transparent the medium becomes: in the least degree of dimness short of absolute transparence, always supposing a perfectly colourless medium, this deep blue approaches the most beautiful violet. He then proceeds with numerous experiments, systematically observing the effects of rarefied media such as dust, air, and moisture on the perception of color. 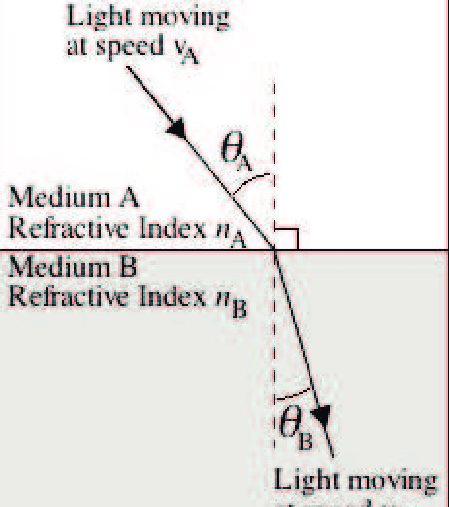 When viewed through a prism, the orientation of a light–dark boundary with respect to the prism’s axis is significant. With white above a dark boundary, we observe the light extending a blue-violet edge into the dark area; whereas dark above a light boundary results in a red-yellow edge extending into the light area. Goethe was intrigued by this difference. He felt that this arising of color at light–dark boundaries was fundamental to the creation of the spectrum (which he considered to be a compound phenomenon). Since the color phenomenon relies on the adjacency of light and dark, there are two ways to produce a spectrum: with a light beam in a dark room, and with a dark beam (i.e., a shadow) in a light room. Goethe recorded the sequence of colors projected at various distances from a prism for both cases. In both cases, he found that the yellow and blue edges remain closest to the side which is light, and red and violet edges remain closest to the side which is dark. At a certain distance, these edges overlap—and we obtain Newton’s spectrum. 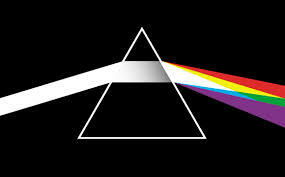 When these edges overlap in a light spectrum, green results; when they overlap in a dark spectrum, magenta results. With a light spectrum (i.e. a shaft of light in a surrounding darkness), we find yellow-red colours along the top edge, and blue-violet colours along the bottom edge. 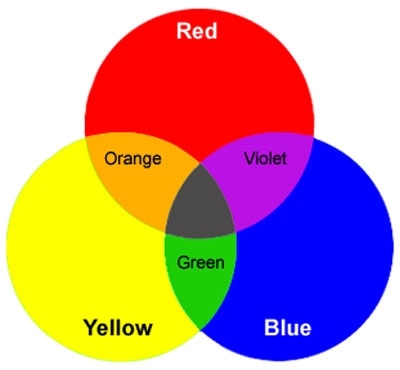 The spectrum with green in the middle arises only where the blue-violet edges overlap the yellow-red edges. With a dark spectrum (i.e., a shadow surrounded by light), we find violet-blue along the top edge, and red-yellow along the bottom edge — and where these edges overlap, we find (extraspectral) magenta. When the eye sees a colour it is immediately excited and it is its nature, spontaneously and of necessity, at once to produce another, which with the original colour, comprehends the whole chromatic scale. The chromatic circle… [is] arranged in a general way according to the natural order… for the colours diametrically opposed to each other in this diagram are those which reciprocally evoke each other in the eye. Thus, yellow demands violet; orange [demands] blue; purple [demands] green; and vice versa: thus… all intermediate gradations reciprocally evoke each other; the simpler colour demanding the compound, and vice versa. In the same way that light and dark spectra yielded green from the mixture of blue and yellow — Goethe completed his color wheel by recognizing the importance of magenta. For Newton, only spectral colors could count as fundamental. By contrast, Goethe’s more empirical approach led him to recognize the essential role of magenta in a complete color circle, a role that it still has in all modern color systems. Goethe also included aesthetic qualities in his color wheel, under the title of “allegorical, symbolic, mystic use of colour” (Allegorischer, symbolischer, mystischer Gebrauch der Farbe), establishing a kind of color psychology. 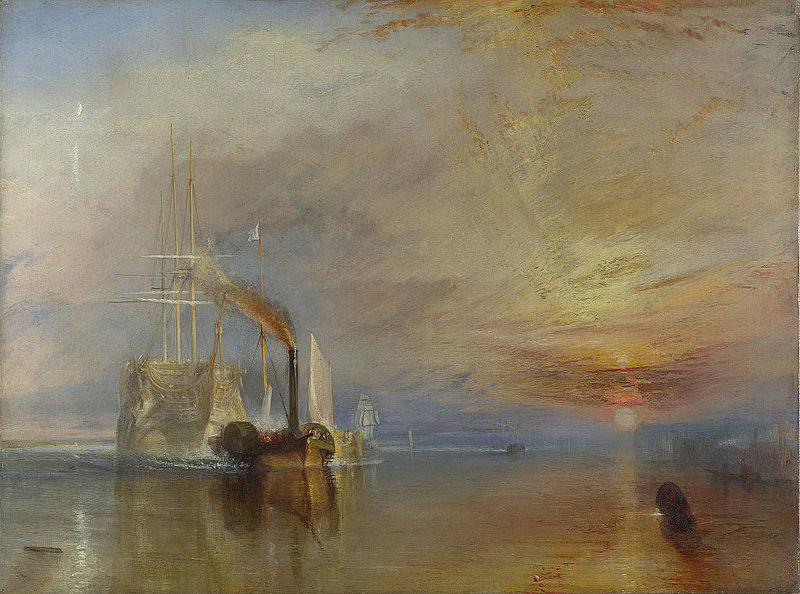 He associated red with the “beautiful”, orange with the “noble”, yellow to the “good”, green to the “useful”, blue to the “common”, and violet to the “unnecessary”. 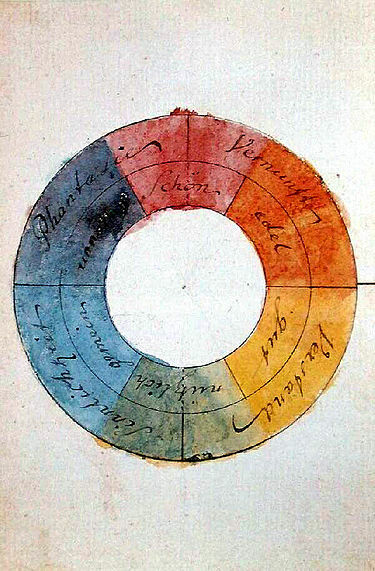 These six qualities were assigned to four categories of human cognition, the rational (Vernunft) to the beautiful and the noble (red and orange), the intellectual (Verstand) to the good and the useful (yellow and green), the sensual (Sinnlichkeit) to the useful and the common (green and blue) and, closing the circle, imagination (Phantasie) to both the unnecessary and the beautiful (purple and red). In simple terms, Newton’s understanding of color was devoid of interest in color as it is perceived by humans whereas Goethe’s studies embraced it. This intrigues me because I have often written on what Max Weber calls the “disenchantment of the world” induced by Enlightenment scientific thinking whereby humans and human perception are subtracted from the process. Physical science is essentially inhuman. Goethe spent much of his professional life in Weimar but his home town was Frankfurt which has many culinary specialties. Obviously this includes the Frankfurt sausage, forebear of the hot dog. But I will pass over them because I have covered hot dogs quite enough, and, in any case, hot dogs bear only a superficial resemblance to the original. 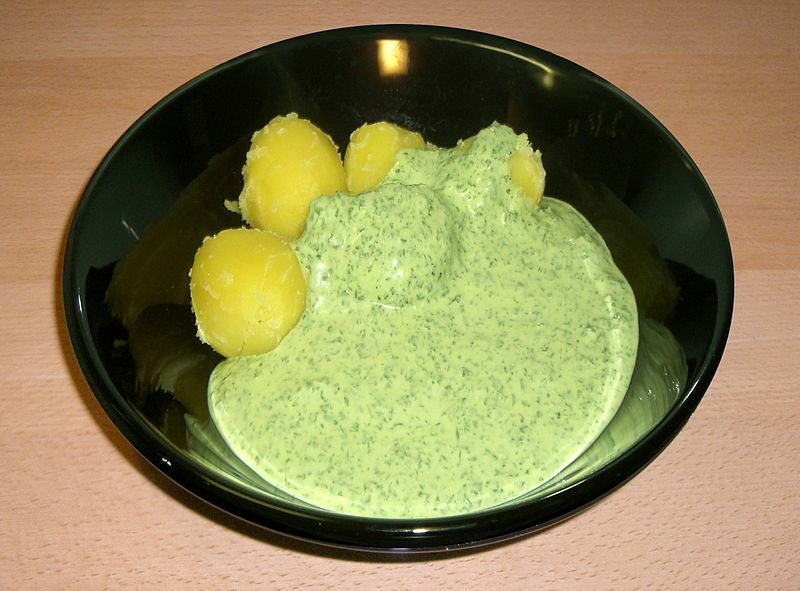 Rather, I will talk about Grüne Soße or Grüne Sosse (Green Sauce) which reputedly was created in Frankfurt, and, according to his mother, was Goethe’s favorite. The Frankfurt-style ( where it is sometimes called “Grie Soß” or “Grie Soss”) is made from hard-boiled eggs, oil, vinegar, salt, sour cream, and generous amounts of seven fresh herbs, namely borage, sorrel, garden cress, chervil, chives, parsley, and salad burnet. Variants, often due to seasonal availability, include dill, shallots, lovage, lemon balm, and even spinach. In more frugal times, daisy leaves, broad plantain leaves, and dandelion leaves were also used.. In Grüne Soße, the eggs are hard-boiled, then sieved or pureed before being mixed with sour cream to form the creamy base of the sauce. The fresh chopped herbs are then added. Some variations use buttermilk, quark, or yogurt instead of sour cream. The sauce is served cold with peeled boiled potatoes as an accompaniment to either hard-boiled eggs or roast beef brisket. It may also be served with cooked fish or roast beef, or as a side dish to barbecue. A local schnitzel specialty, called Frankfurter Schnitzel, is always served with green sauce, along with apple cider (Apfelwein) as a traditional accompanying drink. The following is merely one of many variations. Use the traditional seven herbs or vary to suit yourself. Place all the ingredients in a food processor and pulse until it is smooth.